For the past seven years, composer Christopher Hoag has conjured up battle scenes, storms, romance, and adventure with his music for Kingsmen Shakespeare Company’s annual summer festival. If you’ve seen one of their productions, you know how beautifully his rich orchestral scores enhance Shakespeare’s text on their outdoor festival stage. 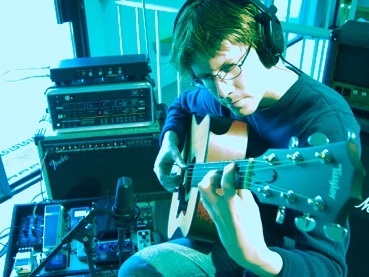 He’s back again this year writing music for two shows: the currently running Henry V, and A Midsummer Night’s Dream, opening July 15. Here he talks about the process of bringing the world of Shakespeare’s plays to life with music. Chris, you’re working with director Michael Arndt on Henry V. Where do you find your musical inspiration? The reasons why the director and I make the stylistic choices we do for the Kingsmen scores are always varied. Sometimes it’s the period, sometimes it comes from a conceptual approach to the play. In the case of our Henry V, it was a combination of both. The score really stems from Michael’s idea to put the Chorus in modern times as a documentary narrator/TV reporter, and the actual events of the play proper in a more period setting. I had to bridge those two worlds. So I thought it would be fun to do a very electronic sounding score; one that’s still dramatic and orchestral in nature, but using predominately electronic orchestrations towards that end. The score is really an homage to the electronic scores that I grew up with in the 80s by composers like Vangelis, Michael Stearns, Tangerine Dream, and Wendy Carlos. It’s been great fun exploring these sounds both in a modern and period context. The electronics also have a tendency to be a bit cooler and removed emotionally, which I believe reflects Michael’s interest in how modern media portrays serious events through a sometimes very aloof and self-serving lens. Ultimately, much of the play is about war; the triumphs and the tremendous tragedies. And those things are also major points of reference for the music. Are there particular cues or sequences we should listen for? I feel very fortunate in that I am often asked to write an “overture” for the Kingsmen shows. It’s a bit of an old-fashioned thing to do, but as a composer it’s a great opportunity to stretch out and to musically “set the emotional stage” for what you are about to experience. It’s also very helpful for me to draw from it as I go through the process of scoring the rest of the play. The overture for Henry V states the main motifs that recur numerous times throughout the show. Beyond that, I’d suggest listening for the “Once more unto the breach” speech which goes into the siege at Harfleur. I love scoring dialog. It’s a delicate thing, but when it’s working there’s nothing better for me personally. And this is such a rousing and powerful speech. Here, the music is constantly building and modulating, but never quite resolving….until the final charge into battle. Of course, aside from the director, it’s always a hugely important thing for the actors to be okay with the music I write for them. And in this case our Henry, played brilliantly by Ty Mayberry, asked for a copy of the music so he could work with it. The cue is in two parts and it’s built in such a way that Ty has plenty of room to play. It’s a good example of the wonderfully collaborative nature of this company. How does this score differ from the one you’re writing for A Midsummer Night’s Dream, which follows Henry V? Kingsmen’s production of Midsummer will be set in British Raj India so the score is completely different. The music will be much warmer and instrumentally acoustic. There’s going to be a strong thread of Hindustani Classical influence throughout; in conjunction with a more traditional orchestral score. It’s a nice change coming from Henry V.
How long does it take you to write and record your score? There is a lot of conceptualizing before the actual composition process; sometimes months beforehand. But the bulk of the work is really done in the two weeks leading up to opening night. A lot of what I do is finding timings and narrative rhythms in the play so we can decide where cues start and end, as well as how long they should be. Unfortunately those timings, especially with fight choreography, don’t really start to get consistent until the final weeks of rehearsal. The week before opening, I am constantly making adjustments and bringing new cues into rehearsal the following night. If it sounds like a lot, believe me….it is. But it’s always very satisfying when it comes together. What is it about Shakespeare that attracts you as a composer? Scoring Shakespeare has been an incredible challenge and education for me. One way I think of my work with Kingsmen is as a continuing experiment in writing scores that are cinematic, and often very modern in their dramatic sensibilities, for these beautiful plays written a long long time ago. A modern musical language juxtaposed with an older language. And so far, it seems to be working. The drama in these plays is just as powerful (and often relevant) as it has ever been. And seeing these talented people year after year bring these texts to modern audiences is inspiring and humbling. It’s really cool to get to be a part of that process. How long have you worked with Kingsmen Shakespeare Festival? This year will mark my 7th year with the company – my 13th and 14th shows. I always tell my friends that scoring Kingsmen shows is like “composing boot camp.” I do two shows back to back over about a month and a half. It’s an intimidating amount of work in a very short time. But it is always, from conception to completion, a great experience. The productions are of a very high caliber. And with every show I’ve done with this company, I’ve always had open and honest collaborations with everyone that I’ve worked with. We all just want to put on the best show we can. It’s a great place to work, and it’s something I look forward to every summer. When he’s not writing for theatre, Hoag also regularly composes for film and TV on networks like ABC, Discovery and Fox. He’s even been nominated for an Emmy Award for outstanding music composition for the pilot episode of House M.D. For more information, visit his website at www.christopherhoag.com. 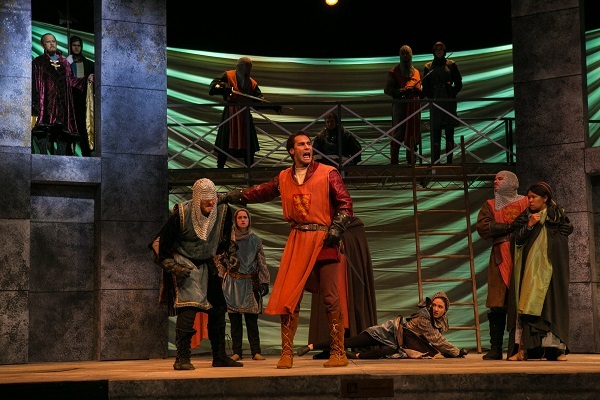 Kingsmen Shakespeare Festival’s Henry V runs through July 10, followed by A Midsummer Night’s Dream July 15 – 31, on the campus of California Lutheran University, 60 W Olsen Rd in Thousand Oaks. Friday, Saturday and Sunday at 8pm. General admission tickets are $20 for adults and free for children under 18. Individual tickets are available at the door only. For lawn box reservations, visit kingsmenshakespeare.org or call 805-493-3014.